Victory Sweepers' Liberator is designed to primarily be an inexpensive 'paper chaser' sweeper to allow profitable sweeping on low margin parking lot sweeping accounts. "Our new Liberator model has been designed as a result of everything we've been hearing from contractors about what people seem to be calling 'the $35 sweep,'" said Mark Schwarze, president of Victory Sweepers, Inc. "Although I don't see how anyone can make money doing sweeping at that price, there's absolutely no way to do so with a $100,000 parking lot sweeper. "The high price of traditional chassis-mounted sweepers is driven, in large part, by the chassis cost. Plus, on the diesel side – especially as the cost of meeting the new emissions' standards continues to increase – engines for a parking lot sweeper are going to cost $10-11,000. Combined with that is the trend toward paying less for an average parking lot sweep. As you pointed out in your recent article about Crown Maintenance, which is running a seemingly successful operation by hand-picking parking lots, the market for parking lot sweeping is currently in serious flux. "We sat down and asked ourselves 'What does this market need?' The answer we came up with is a sweeper with a low cost and pretty good performance. When you're competing in that marketplace, but want to do so with a sweeper instead of operating a hand-pick crew, you need a sweeper that does well at picking up paper, cans, bottles and the other visible debris in a parking lot. And, we felt it needed to be a high dump so you could still offload into dumpsters and keep moving." At first glance Victory's latest sweeper model, which may be mounted on any standard-sized, 1/2 or 3/4 ton pickup chassis, appears to be a slide-in unit. However, although the sweeper may be removed from the chassis in about an hour's time, it is actually bolted in with the expectation of more permanence than that. The tailgate and bumper are removed but not the pickup bed. Then, with the addition of several bolts to secure the unit, you're sweeping. The machine has a 1.7 cubic yard, high dumping hopper. Perhaps the most unique aspect of the center pickup machine is that all debris goes through the fan. "The Liberator has center suction," said Schwarze. "Everything that is sucked up goes through the fan, is ground-up and is then blown into the hopper. This creates pressure in the hopper; two 8" tubes transfer the air back down to the sweeping head, which regenerates the air and re-creates the suction for pickup. We have found that to be a surprisingly effective, dust-free sweeping method. "Blowing into the hopper rather than sucking from the hopper is a different way to do it and so far we're real happy with how it operates. With all of the debris going through the fan, the question that arises is how the fan will wear. In part because this sweeper is not designed to have the power needed to pick up significant sand and rocks, our testing shows that early fan wear will not be a factor." The Victory engineers are using the very highly abrasive-resistant Hard-Ox steel for the fan. This extremely hard metal capitalizes on the last few years' technological progress for how abrasion-resistant steel is able to be made. The company's new sweeper design, of having debris go through the fan, is capitalizing on that technological breakthrough. However, to allay fan wear concerns Victory will have a one- or two-year warranty on the fan itself. Schwarze says their testing shows that the fan on the Liberator will hold up better than a standard regenerative air sweeper fan because they are not pumping sand and gravel through it." The Liberator will be offered with an optional curb blower that can be employed out the driver's side window. The clean air blower is driven hydraulically, which Schwarze says gives it plenty of power. The engine for the Liberator is a 25hp Kohler. The fan size is 18" and it spins from 1,500 to 2,000 rpms, depending upon what you're picking up. Plus, because the debris is going through the fan it is getting chewed up and, so, compacted significantly. The sweeper's initial pricing will be $39,900 when mounted onto one of several new pickup chassis. 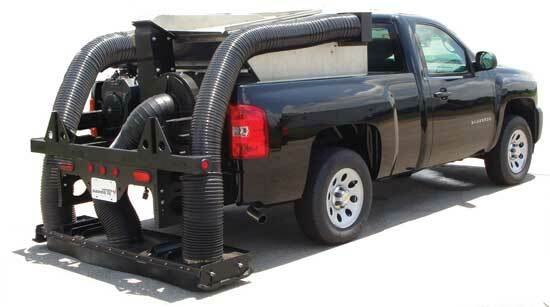 The sweeper portion may also be purchased separately for mounting onto a customer's existing pickup. Use this link to access specifications in PDF format. For complete information, we invite you to listen to the accompanyin 24-minute podcast audio interview with Mark Schwarze. Note: The audio interview with Mark Schwarze will play without downloading any files onto your computer. If you hear the interview at 'chipmunk speed,' you will need to download the latest version of Adobe's free Flash player. You can contact Mark Schwarze at Victory Sweepers, Inc. by calling 866.507.9337. The company's website is www.victorysweepers.com.